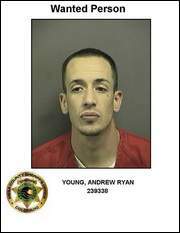 Andrew Ryan Young says meth made him do it. Colorado Springs man said methamphetamine fueled a confrontation in which he rammed several police vehicles and shot at officers during a November incident on Glade Park. Andrew Ryan Young, 29, was sentenced Wednesday in Mesa County District Court to 28 years in prison in exchange for a guilty plea. He told judge Valerie Robison he was sorry for his actions. “On the day of Nov. 13, (2006), I was highly influenced by methamphetamine,” Young told the court. “I’m not the same person when I’m on drugs than when I’m sober. I want to say to the city of Grand Junction that I’m sorry for shooting at police officers. I’m sorry for what I did.” Young pleaded guilty to attempted first-degree murder, attempted first-degree assault and two counts of crimes of violence. He received consecutive sentences of 18 years for the first count and 10 years for the second count. Young was originally charged with 33 felony counts after a series of events in which he stole a car in Boulder on Nov. 11. Two days later he pointed a gun at a police officer during a traffic stop in Grand Junction before speeding off to Glade Park, where Young rammed three unmarked police vehicles that served as a roadblock. Young will have to pay fines of $7,962, and restitution charges may be pending. Young’s prison sentence was lengthened because he was on probation in another case during the confrontation. “Twenty-eight years is a substantial amount of time, and I think it’s appropriate in this case,” Chief Deputy District Attorney Tammy Eret said. After the hearing, Eret said Young won’t be reviewed for parole until 21 to 22 years into his prison terms.